Global Social Media Prism 2017/2018 // Social Networks, Media, Tools » ethority » Brand Engagement & Loyalty » Experience Era. It’s a good day to have a SOCIAL day. Get the latest Social Media trends and updates. Subscribe to our weekly newsletter. 2. Don't miss further updates to the prism and subscribe to our newsletter! The Global Social Media Prism is an initiative of Digital Pioneer, Marketing Artist & Futurist, Sten Franke, ethority, (Digital Marketing Intelligence) and DataChamp24 (Digital Media Intelligence – Monitoring & Content Performance Analysis). 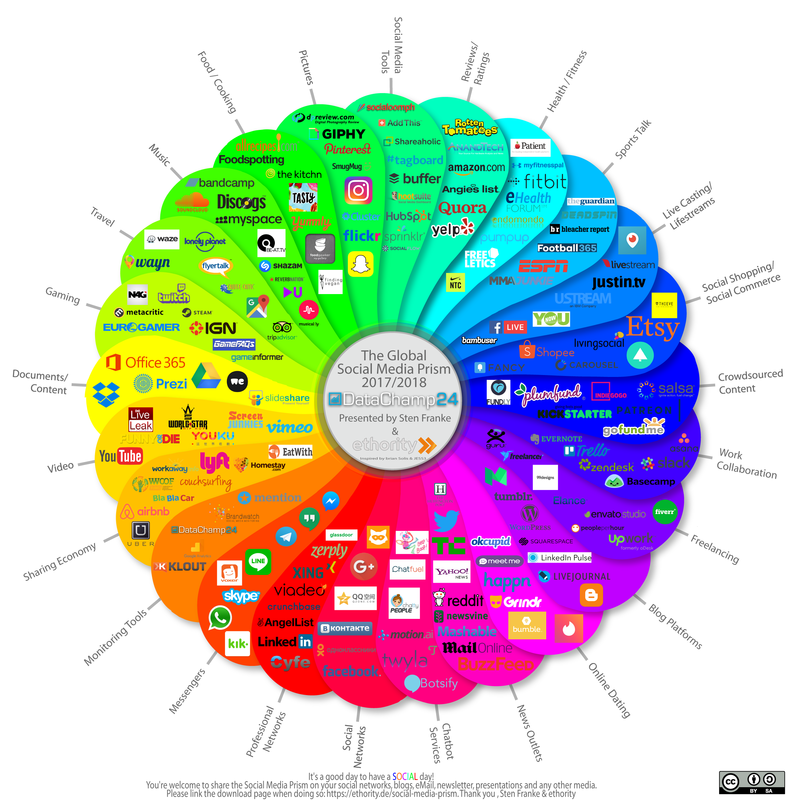 In the 3 years since our last social media prism update, many evolutions have affected the landscape of social media, connectivity, and how we interact with each other. Sites and apps began diversifying their offerings, expanding their content pool as the shift to a fully digitally connected world rapidly took place. This new Global Social Media Prism is a representation of social media channels and websites where the most relevant interactions are taking place today, as well as for the future, and the tools that are assisting in the generation and/or monitoring of social engagement around the world. With 10 new categories and 100+ new entrants, this is the most relevant and comprehensive prism release ever, and is sure to give you the insight needed into relevant channels and tools to help you navigate the social world today. The Social Media Prism China and Social Media Prisma Germany supplement the trilogy. Because of its frequent use in approx. 25,000 presentations, hundreds of blogs, numerous specialist books and scientific papers, it is probably the best-known visualization and cartography of the Social Media. (1) The Global Social Media Prism can be published on your Facebook, Instagram, Twitter, Pinterest,… blog, website or publication, with a link and hashtag to #ethority #globalprism. (2) Comments and suggestions for improvement are welcome!